Cruikshank creates visual continuity with the earlier plates by placing the coal-grate with its chained poker, the source of warmth in the chilly, barren room, to the right, and the doorway to the left, which matches the juxtaposition Cruikshank established in the family parlour in the opening scene. The daughter, now emotionally detached, stands just left of centre, standing on the bare floorboards. The father wears a jacket and trousers that are no longer torn, but he wears slippers rather than shoes, suggesting that he will never walk the streets a free man again but will remain an inmate for life. His shorn head, a prophylactic against lice, is the singular badge of his imprisonment. Despite the fact that he sits next to to a roaring fire, the madman clutches himself, as if he is cold, his staring eyes suggest that, in his mind's eye, he is seeing something horrible — presumably the corpse of his murdered wife. The son and daughter study him objectively, as if he were a curiosity, as the turnkey (far left) casually studies all three of them, establishing an atmosphere of surveillance. Bars at the window, in the door of the cell, and around the fire establish the forcible restraint under which the madman, oblivious to his visitors or the passage of time, will await his final release from his gin-induced madness. The polemic is complete, at least until Cruikshank takes up his etching needle to show the dire consequences of the father's gin-addiction visited upon his offspring in The Drunkard's Children. And yet such calamities as that which "old George" has drawn happen every day; beginning not in sorrow, or poverty, or ignorance, but in little yieldings to temptation, in apparently trivial and accidental excesses. What constitutes intemperance? According to Dr. Alfred Carpenter, any consumption of alcohol sufficient to furnish the blood with one part of alcohol in five hundred of blood, is dangerous to health, and therefore is an act of intemperance. A more moderate indulgence, he says, is not yet proved to be deleterious. The late Dr. Anstie put temperance in a different way. An average man or woman cannot, according to him, take more than a couple of glasses of sherry daily without injury. Dr. Carpenter has denounced the habitual use of stimulants, even in a very diluted form, to enable the drinker to do more work than he could get through without them, as unquestionably injurious — and therefore an act of intemperance. There is not a middle-aged man of education who has not come across the wrecks of lives where the ruin was a gradual giving way to the temptation of stimulants. [Jerrold," pp. 96-97. Cruikshank used to relate how, when his "Bottle" was finished, and he was anxious to secure for this first Temperance sermon the widest possible publicity, he carried the plates to Mr. William Cash, then chairman of the National Temperance Society, for his approval, and the support of his powerful Association. Mr. Cash, although a Quaker, was a gentleman with a very sharp, humorous manner. Having attentively examined the series, he turned upon the artist, and asked him how he himself could ever have anything to do with using "The Bottle," which, by his own showing, was the means of such dreadful evil? Cruikshank, in his own forcible way, described how he was "completely staggered" by this point-blank question. He said, when he had left Mr. Cash, he could not rid himself of the impression that had been made upon him. After a struggle, he did not get rid of it, but acted upon it, by resolving to give his example as well as his art to the total abstainers. . . . . The sonnet with which Matthew Arnold addresses the illustrator of the descent into a man-made Hell in The Bottle demonstrates the reaction of a particularly sensitive member of the intelligentsia, a university-trained intellectual of the upper-middle-class for whom Cruikshank's series offered a glimpse, like the underworld chapters of Dickens's Oliver Twist; or, The Parish Boy's Progress, into a subculture hidden in plain sight, in the working class slums of East London. The contrast between the fair English countryside which the poet is visiting and the purgatorial vision of the Hogarthian sequence which he has just purchased and is now studying in the "breathless glades" of September 1847 informs his "reading" of Cruikshank's work. Like comets on the heavenly solitude? To pain, to death, the bent of his own days. was immediately rewarded by the extraordinary success which The Bottle achieved. It was sold by tens of thousands, and was the talk of the day. If it has not directly led to a tangible result, as Hogarth's Harlot's Progress is said to have led to the foundation of the Magdalen Hospital, it and the "Drunkard's Children," a poor sequel (but then sequels are always poor), have had the effect of powerful, popular, and permanent sermons against the monster evil of our time.​— "Chapter 2, The Bottle, pp. 254-55. 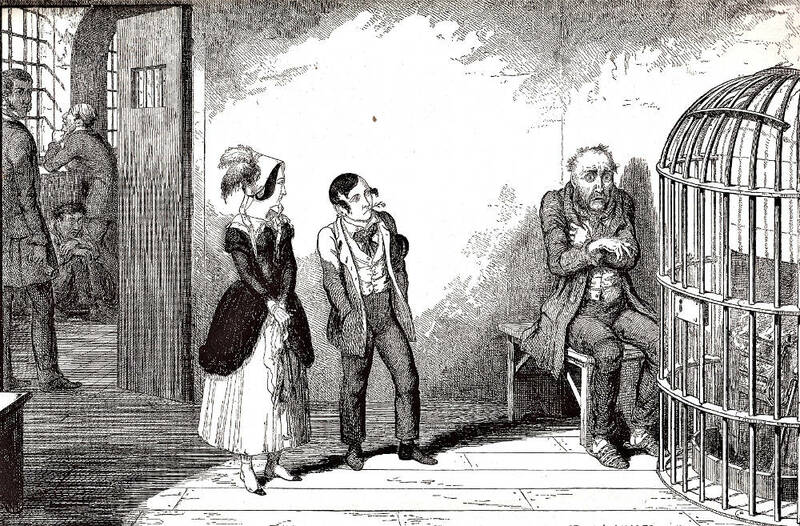 The final appearance of the son and daughter in The Bottle as they visit their father in the asylum for the criminally insane prepares the viewer for the 1848 sequel, The Drunkard's Children, held by a number of early critics (including Blanchard Jerrold, quoted above) to be decidedly inferior to the initial series of eight illustrations. Cruikshank takes up the family's story in 1848 where he left off in 1847, following the contrasting but equally tragic fates of the criminal son and the prostitute daughter​ to their logical ends. Although, as Richard A. Vogler remarks, Cruikshank's handling of his sensational material is "neither more nor less doctrinaire," owing to the variety of the scenes and the large number and variety of secondary characters, The Drunkard's Children​ "is more dramatic and creates more historical interest" because it dramatizes "scenes of lower-class Victorian life that were seldom portrayed in the arts of the period" (p. 161). Whereas in illustrating Dickens Cruikshank had to attend to the details in the text and shape his conception of the drinking scene such as The Gin-Shop (1836) accordingly, much to his delight in his project for the Temperance Union he could control the storyline in his own "wordless" novella, The Drunkard's Children. In his pictorial telling​ of this sordid tale, Cruikshank had to rely only on repeating characters since, unlike his strategy in The Bottle, he could not repeat a single room to develop the action. Moreover, in the 1848 sequence a number of the scenes are highly crowded, so that the viewer sometimes has to search for the drunkard's son and daughter, upon whom the illustrator is relying to provide visual continuity.​ In this sequel, Cruikshank employs a number of settings associated with proletarian London: the gin-palace, the beer-shop, the dancing-rooms, a three-penny lodging house, the courtroom of the Old Bailey, a lockup, the infirmary aboard a prison transport or "hulk," and one of the spans of New London Bridge. Arnold, Matthew. "To George Cruikshank, Esq." "The Strayed Reveller," and Other Poems. London: B. Fellowes, 1854. P. 27. Feaver, William. ​"'At it Again': Aspects of Cruikshank's Later Work." George Cruikshank: A Revaluation. Ed. Robert L. Patten. Princeton: Princeton U. P., 1974, rev., 1992. Pp. 249-58. Jerrold, Blanchard. "Epoch Two, 1848-1878. Chapter 2, The Bottle." The Life of George Cruikshank. In Two Epochs. Illustrated by George Cruikshank. 2 vols. London: Chatto and Windus, 1883. Vol. 2, Pp. 89-100.